ComicCon 2018 Sampler! Free downloads! Welcome! Animation Resources is excited to offer a Comic Con special Wednesday July 19th though the 22nd. Have you been thinking about joining Animation Resources, but you wonder if it’s worth the price? This week we are offering a special set of downloads in celebration of the San Diego Comic Con. Follow the links below to download a great e-book featuring Jack Cole’s Plastic Man and some rare cartoons! We hope you will choose to become a member of Animation Resources. Every other month, members are given access to a high resolution e-book and several DVD quality animated films, curated by the Board of Animation Resources. This sample is just a small fraction of what members get- our regular RefPacks are more than twice this size. By the end of the year, you will have over a thousand pages of incredible high resolution scans and hours of rare cartoons. It’s the greatest bargain in animation… and you’ll be inspired and learn too! To download the files, RIGHT CLICK on the link (Mac users OPTION CLICK) and select SAVE TO DISK. We are delivering high resolution files to you. When you click, it might take several minutes to finish the download, so please be patient. If the link doesn’t work, refresh this page and try again. Jack Cole’s “Plastic Man” debuted in Police Comics in 1941 and was an immediate hit. 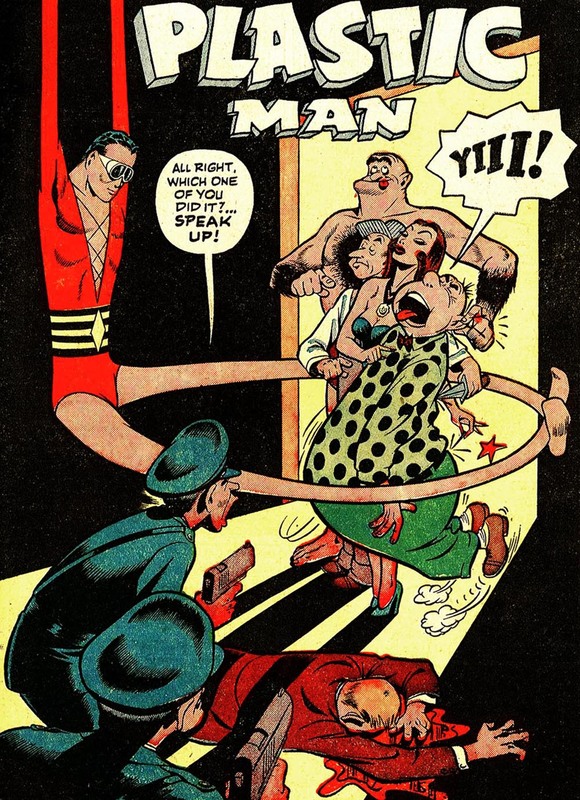 Cole’s offbeat humor and Plastic Man’s ability to take any shape gave the cartoonist the opportunities to experiment with text and graphics in groundbreaking manner, helping to define the medium’s vocabulary, and making the idiosyncratic character one of the few enduring classics from the Golden Age to modern times. Plastic Man gained his own title in 1943. This PDF e-book contains the first three issues of Plastic Man comics and includes a biography of Jack Cole. It is optimized for display on the iPad or printing two up with a cover on 8 1/2 by 11 inch paper. The Private Snafu training cartoons were produced by Warner Bros for the War Department during WWII. “Gas”, which deals with the importance of having an operating gas mask handy, was directed by Chuck Jones and written by Ted “Dr Seuss” Geisel. The voices were by Mel Blanc and Billy Bletcher. This DVD quality MP4 file is provided courtesy of Thunderbean Animation and is included on Private Snafu Golden Classics . Disney admitted that in the 1920s, his goal was to produce cartoons as good as the Aesops Fables series. However after the Fables introduced a boy and girl mouse that bore a strong resemblance to Mickey and Minnie, Disney filed suit and had the cartoons pulled from theaters. This cartoon is one of the most blatant Mickey ripoffs, and one of the funniest. This DVD quality MP4 file is provided courtesy of Thunderbean Animation and is included on Uncensored Animation from Van Beuren. This entry was posted on Tuesday, July 17th, 2018 at 11:13 PM	and is filed under membership.